I don't get sent many books to review, but this is not a problem as I'm quite fussy and would not like to have to interrupt my bloodthirsty or psychological criminal thrillers too often with romantic slush or other fluffy literature. However, I'm a keen foodie so a book on food and eating in France will immediately gain my attention. This one seemed to combine both, so when the publishers asked me to read and review it, I said yes, but did warn them that my readership is fairly limited (and I don't have an Oprah effect of immediate sales the moment I say I like something, more's the pity...). Ann Mah is an American of Chinese origin, and I really enjoyed her writing. 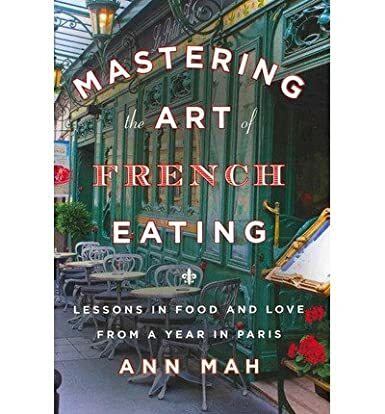 I particularly admired the way she links from stories about her life to her exploration of French food because how she could make the transition was not immediately obvious but she managed to carry it off extremely well - very smooth and delightful to read. I do not share her passion for Paris though, so all the lyrical descriptions which illustrate her deep-seated love of the city passed somewhat over my head. Paris, for me, is a pretty place but lacks dynamism. It's nice for a visit, but I would hate to live there and suffer the metro, RER, pollution, noise, traffic, high prices and time-wasting. My main contact with the place in recent times has been the RER from Gare de Lyon to Gare du Nord where you might think you were in downtown Douala rather than gay Paris. The book is not just about Paris and food though. Ann Mah tells us a bit about her childhood and how she fell in love with Calvin, a diplomat, which meant she had to put her own successful publishing career to one side as they travelled about the world. I liked reading about how she dealt with that and how she found the means to overcome some of the issues of being an accompanying spouse. The poor woman had just settled into the city of her dreams with her husband when he was called away to Iraq for a year, so she had to stay in the "city of romance" without her partner-in-love. How's that for pas de chance? It could have been worse though, she could have been in Slough! And at least she could develop a project based on food and eating (and drinking), and had the means to indulge her foodie passion. This is an enjoyable book if you like Paris, France and food, and appreciate an honest approach to love and life. All is not rosy in Ann Mah's life, as you may have gathered, but she deals with her loneliness and isolation, even though she moans a lot about missing her husband. Actually she comes across as a someone it would be fun to have lunch with. This book would make an excellent present for a Francophile foodie. Other chapters are devoted (and I use that word wisely) to crepes, steak frites, andouillette, salade lyonnaise, and soupe au pistou. My favourite moment in the book is when she recounts eating cheese fondue in the middle of summer. I had a good laugh at that, plus when she observed that the French do not like cinnamon which she realised after she'd made a pumpkin pie for a foodie family at Thanksgiving. I could just imagine them taking a small bite, making a mou and politely pushing it away. Oooh, you review books? Wowsers. Who for? (Nosy cow, I know. You have the right to say "if I tell you, I will have to kill you" if you like). Your review is great - balanced and fun to read, which isn't always the case with some reviewers. I couldn't read a whole book about food, I'd end up eating all the way through. Hmm. Curious stuff. Big Penguin is watching you! Well, your review made me hungry and I have just had breakfast. Just like you, I don't understand why people love Paris so much. Maybe it is because I used to work and live there. It is a lot less romantic when you have to take the tube everyday, right? Absolutely! My DB hates the place because he had to do just that, spending hours crossing Paris every day to get to work in the different places where he was a consultant. Sarah, for somebody who doesn't normally review books, you did a stellar job! I'm wondering something though. Since when do the French not like cinnamon? Guess I'll have to get the book (it's on my list) to find out! Happy holidays! I hope all is well with you and DB! Do let me know if you have any upcoming plans to travel north! You're still near Toulouse, no? I'm often sent books to review and it can be hard to be objective when the books aren't necessarily ones you would choose yourself. But you have to be honest with your readers, whilst doing your best to tell others, who do like a particular genre, whether it is worth a read. I like the sound of a foodie book with a back story. Interesting to know about the cinnamon and mince pies. Remind me never to put the former into the latter if I ever have another exchange student! I've had a couple of books to review recently and each time I was emailed first to ask if I would be interested in the book. This meant I could refuse if I thought it was not to my taste.